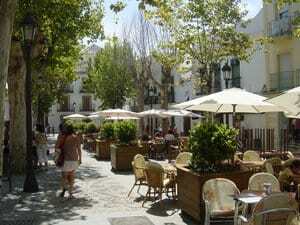 The town of Nerja is located in the Province of Malaga around 45 minutes from the city of Malaga by car. It’s a town that enjoys a privileged position with its proximity to both Malaga and Granada making it a great base to explore the region. There’s much more to Nerja though, with the town, despite only being a relatively small place, having a number of claims to fame that might surprise you. This coastal town whose economy has historically been based around agriculture rose to fame following the discovery in 1959 of a series of caves and caverns by five local boys. The caves provided a fascinating tourist attraction which initially drew in national visitors but as scientists have studied the caves, constantly making new discoveries, have proven to be of significant importance thanks to paintings within dated at approximately 43,000 years old. The caves are now a truly international attraction with visitors from all over the world taking the opportunity to wander the caverns making it Spain’s third most visited tourist attraction. The caves sit at the feet of a large Natural Park that covers some 40,663 hectares. The Sierras of Tejeda, Almijara and Alhama are made up of three mountain ranges forming a natural border between the neighbouring provinces of Granada and Malaga and offer a wealth of hiking routes for walkers of all abilities. If you make it to the top of one of the peaks you’ll be rewarded with fantastic views of the Axarquia region to the west and another natural park, the ‘Acantilados de Maro-Cerro Gordo’ to the east. This natural park runs along the coast from the village of Maro to La Herradura and offers beautifully untouched beaches, waterfalls falling straight into the sea and crystal clear waters. It also is home to Maro beach, consistently voted as one of the best in Andalusia. As a seaside resort beaches are very much at the heart of the town and are undoubtedly one of its great strengths when compared to other towns along the Costa del Sol. Nerja has one principal tourist beach on its eastern edge, Burriana, but this is just one of lots of options for visitors that are easily accessible from the town. Nerja is fortunate enough to have numerous beaches and coves meaning you can literally go to a different beach every day of the week, all of which are in easy walking distance from the town centre. 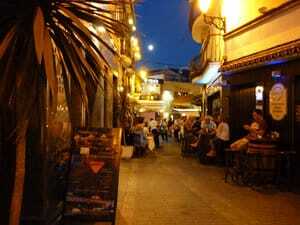 As with many coastal tourist destinations, there is a beautiful old town area making up about half of Nerja itself. The old town is a bustling place, particularly in summer, with a wealth of good quality restaurants and bars tucked away in every nook and cranny although the old town’s best moments of the year tend to come during Easter, with the narrow white walled streets playing host to a week full of processions. The streets lined with tourists and locals, provide an enigmatic setting for one of the most photogenic events in the town’s calendar. 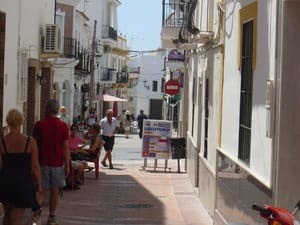 In summary, Nerja is very much a family destination, which despite being the principle tourist hub of the eastern Costa del Sol still retains much of its typical Andalucian charm. It has avoided much of the heavy commercialisation that is sometimes associated with the towns to the west of Malaga and enjoys a mild year round climate making it a popular holiday destination for both national and international visitors.